Never drive up to Dharamsala. Or anywhere from India’s flatlands to the lower reaches of the Himalayas. If you really must, do it after 30 hours of flights and layovers. Try to run those off the back of a weekend-long music festival. Don’t be hungover – that definitely won’t help – but go into the thing as fatigued as your body allows. Then take the night bus. Bearing in mind that you are on your way to the Dalai Lama’s hometown, you will enjoy some valuable meditation time by an anonymous petrol pump at a dark roadside. When the 11:30pm service picks you up at 1am, you will be too spiritually content and/or exhausted to even remember your nausea pills. Get the kind of bus with reclining seats, plug a podcast with a soothing voice into your headphones, and do not open your eyes until you get there. You will crash deep into a hybrid sleep-hypnosis, wedged in a little too cosily with the large gentleman next to you, rocked by the arms of an erratically enthused mother until you arrive under an early sky spread out in mother-of-pearl grey. One cliché suggests you should expect chaos in this country, and that particular gem does not disappoint. I did sneak a few looks when we were near the end, briefly enough to avoid hurling into the seat pocket in front. The bus climbs a hillside like a startled cat climbs your shoulder. There are lights spread out on an alpine plain below. Behind it all, rows of Himalayan peaks, slowing your breath by the sheer act of being there. They are more there than anything has ever been. This World Twenty20 is my first trip to India, and I bit off a chunk: 19 games in 20 days across six cities with a dozen changes of locale. But on arrival, while everything is new, much of it is expected. One cliché suggests you should expect chaos in this country, and that particular gem does not disappoint. 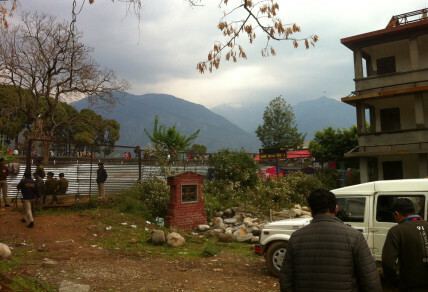 Dharamsala is an isolated mountain town with limited infrastructure. The India-Pakistan game has already been moved at the last minute. Australia-New Zealand will go ahead. 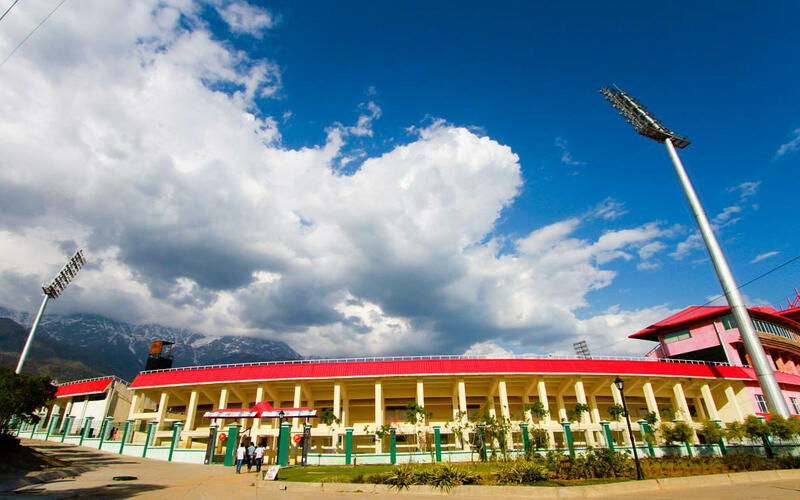 Heading down to the Himachal Pradesh Cricket Stadium the day before the match involves barrelling in a tiny hatchback down roads so narrow you could reach out either window and pick up a mobile phone or an orange from one of the street-side stalls. The closer to the stadium, the more tightly nested the surrounding roads. Police barricades pop up at random. Proceeding on foot, the approaches to each gate are mud-pits with the occasional duckboard or stepping-stone brick. Every gate is, of course, the wrong one. I wind up in the grounds of what looks like a cadet training camp, with a high brick wall between me and the road, and a long walk in the rain behind. I climb onto the bit with no broken glass, and look back to see a woman standing in a doorway holding a broom, smiling and wagging her finger. I press mine conspiratorially to my lips before jumping down into more mud as she laughs behind me. The police at the gate where you collect your pass say they don’t have any passes, and I should get mine from inside. They won’t let me inside to get it because I don’t have a pass. Catch-22 glory rolls over us in clear hilarity. It is mid-afternoon and darkening, I have not eaten all day and am near delirious while freezing in a cotton jumper, and we all wait together in the Himalayan rain for two hours, staring out at the mist over the Sport Authority of India academy. The security head’s name is Rahul, so we talk about Dravid as enthusiastically as each other, and about this Rahul’s chance meeting with Adam Gilchrist while working at the airport, and we talk about philosophy and books and Osho, and styles of living and modes of family structure. He looks sad when he sees that the ring on my wedding finger is a bottle opener. Perhaps he’s right. For the past year I’ve had the best job in the world: travelling to England, to New Zealand, zigzagging across Australia, for every Test the national team has played, and almost every other game. I’ve written about it and worked on radio with people I admire. Shot videos and recorded podcasts and done commentary. Talked serious cricket and absolute codshit. Made a living doing it, and made friends around the world. Through that whole time, I’ve been in the claws of a depression that barely relaxes its grip. I’ve woken up on mornings where I can’t move, the palm of a giant hand pinning me flat. I’ve trailed colleagues, needing to be buoyed into the basics of our working day. I’ve taken on jobs I shouldn’t out of professional stubbornness, then been unable to do them on time or to standard, widening the gyre of self-discontent. There have been wonderful moments. Brendon McCullum leaving cricket in the most McCullum way possible, that absurd Christchurch hundred. Adelaide’s bubble and froth to a pink-ball Test under pink skies. I saw a World Cup final, a Mitch Johnson special at Lord’s, now this tour of India which has been a daily rush of stimulus. I met Roar veteran Diggercane in Wellington and found that he’s as much of a gent in person as on the comment boards. I know the worth of these moments, but often there is a barrier between me and the experience. They are scenes on the far side of a shop window, dulled by double-glazed glass. Occasionally the door opens, the bell above the frame jingles, and I’m able to stick my head inside. There has been joy along the way. But in between is life with the sound turned down, colour faded to monotone, picture giving way to static. We are broken; our systems do not work. People fall apart and we don’t know why. I don’t know how it varies across cultures and countries, but in my own I can count the the tally of friends and loved ones who are dead or have tried to make themselves so; or who can’t stop obsessing about the idea; who are damaged by events in some distant place or their own homes; or have destructive behaviour they can’t master; or live on a cocktail of medications, or an orbit around secure facilities; or the ones who make others miserable, or feel that way themselves and don’t know why; or the legion who just do what I do, pour a bit of booze on it and push on like there’s nothing wrong. India also drives home the classic objection: in a land where so many people struggle, how can privileged Westerners feel sorry for themselves? There is an insoluble truth to it, but something my father said also stayed with me. “Despair is not relative,” was his formulation. When you’re in it, you’re in it – an absolute state. The causes might be more or less important, or more or less deserving, or more or less grave; the state remains regardless. In Dharamsala, I meet some colleagues for the first time and have one of those nights when I’m flying. The conversation is bright, the jokes land just right. For people who rely on humour, there are days when you’re in the zone as much as any batsman: crisp on every shot, having to remind yourself not to get carried away. I feel patched, after days of feeling like a bag of parts. But I also know that this insulation is thin as a rubber glove. I go home that night to suffocating dreams about murders in basements that leave me staring into pre-dawn murk, the weight back in place, trying to fathom where such ideas are born. The sky has thundered down all night. Boughs high on the hillside overhang the ramshackle hotel: rain still runs through them, and down the gully outside. The sound of water never stops. In a way, I hope it won’t. There would be something fitting about travelling so many hours and so many miles for two games that never took place. Two ideas that never took form. That might have been played on the other side of glass, or been moments when the door swung open. The game does go ahead, New Zealand taking down Australia in an afternoon that clears to gentle mountain sunshine. There are moments to be enjoyed. My one-time nemesis and now beloved curiosity, S.R. Watson, opening the bowling and the batting. Colin Munro’s switch-hit late cut combining the Maxwellball effect of confounding audacity with a new element of astounding grace. The next day there is another road to be driven, another city to be camped in, three deadlines to meet, another plane, a game, a city stop for 16 hours, a flight again. And no – as usual, there is no time to ask why I’m doing this, just a vague sense that pushing on might stop everything else falling apart. That coming to a standstill makes the bike fall over. There’s a sense of obligation to a future self, experiencing things I may not be able to appreciate now, but that can be stored away for nourishment when better able to use them. Perhaps writing this is also a gesture towards that end. It can be hard to distinguish what your motivations are in the moment, but sometimes the strength of having them has to be reassurance enough. Geoff is one of the longest-running experts The Roar. He is a writer, broadcaster and editor. Other than The Roar, Geoff can be found on the ABC, The Guardian Australia, English literary journal Going Down Swinging and on Twitter. Image Credit: All images are from Creative Commons, unless otherwise noted.